I was delighted to have been asked by the owners of this property to paint this beautiful Federation weatherboard house. The home would have been occupied as such until sometime in the late 1960’s when it was converted into the local Post office. I don’t have any recollections of this, but do recall its subsequent use as a nursery for many years in the !990’s and beyond. I have added some added interest by way of portraying the owners daughter walking the family dog pass the building. 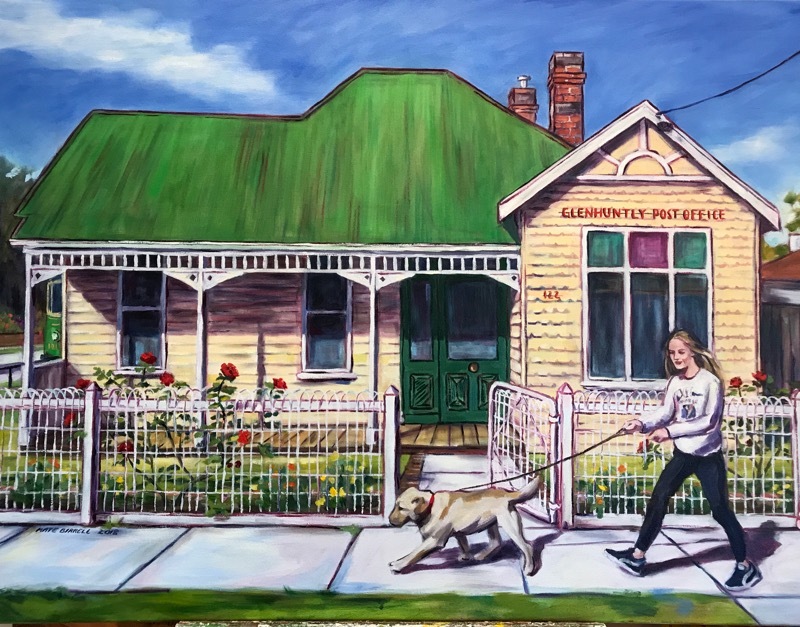 The painting is hanging in the Grange Junction Cafe; 122 Grange Rd, Glen Huntly. I was away for a little while last month and came home to find my maiden hair ferns dead. I forgot to ask the boys upstairs to water them. Over the last two weeks I have removed all the brown, dried up foliage and pepped them up with plant food from Safeway in the hope they will resurrect. I had all but given up on them until yesterday morning when I finally spotted one tiny piece of verdant foliage beginning to unfurl. Yay. This morning I checked again. There are now two new shoots making an appearance..in one pot only. None in the other yet. They have been sprinkled generously with water and are sitting under the eaves of the falling down veranda out the back of the studio. It has also been quite a while since I have either written anything, either here or on my Drawing Life blog www.drawinglife.me. Writing feels clunky when you don't do it regularly. It has also been ages since I have gotten into a painting. I had tidied up my commissions before Christmas, had a big Christmas Day and a beach holiday up north, then got the youngest two back to school and then away again to catch my husband and son in America. It was my first trip to the United States. So, I am finally back putting paint on canvas and thinking about the sort of paintings I want to do this year. With Art Town 2016 coming up, I have given some thought and done a few preparatory sketches. The rest can now wait until April 2, 3, 9 & 10 when the live art weekends will take place. Following that the plan is to continue with still life work and the urban portraits. One of the commissions I did last year was for a book cover. The brief was that it had to encompass sport in the form of footy, cricket, golf and horse racing. The artwork was oil on canvas and 100cm high by 76cm wide. Let me know if you would like a copy of the book. And on Facebook you will find some in progress pics from the studio. Got to go...Easter liturgy at school followed by a cake stall. May there be abundant blessings for peace among all, new growth for the maiden hair and that the tigers remain strong and bold for 2016. A recent work for the entry foyer of a Melbourne apartment building. The piece was developed from sketches of Melbournes skyline from the Ormon Point hill in Elwood; previously known as Little Red Buff. It is the location into which sailed the ship Glen Huntly in the 1840's. Read here for more details.